The John Guest Plastic Half Cartridge provides a quick, efficient and easy way of securing a Speedfit push-in connection into a wide variety of original equipment. As the cartridge requires low insertion loads it is suitable for many different housing materials. This Half Cartridge includes the following three components: a black collet or gripper, a EPDM o-ring of food grade material, and a black plastic body with stainless steel teeth. 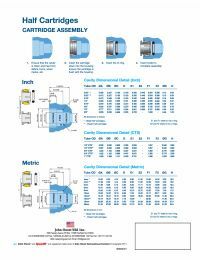 As with all Speedfit products, the push-in connection can be used on plastic or soft metal tubes in both inch and metric sizes. The cartridges are suitable for a very wide selection of original equipment including manifolds and multi-connection points and, because they are produced in food grade materials, Drinks Dispense and Water Purification equipment. NOTE: As Plastic Half Cartridges are intended for use by Original Equipment Manufacturers they are only supplied in bulk quantities.